The Open Urology & Nephrology Journal is an Open Access online journal, which publishes research articles, reviews/mini-reviews, letters, guest edited single topic issues and images that are unique or highly illustrative accompanied by a brief one-paragraph description of relevant clinical information in all areas of experimental and clinical research in the fields of urology and nephrology, renal replacement therapy (dialysis and transplantation), transplantation, radiology, endourology, prostatic diseases, nocturnal enuresis, pathology, erectile dysfunction. 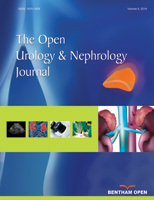 The Open Urology & Nephrology Journal, a peer-reviewed journal, is an important and reliable source of current information on developments in the field. The emphasis will be on publishing quality papers rapidly and making them freely available to researchers worldwide.